1. MOON CRATERS and rough ice proliferate after classes for children, especially during the summer when kids are out of school. 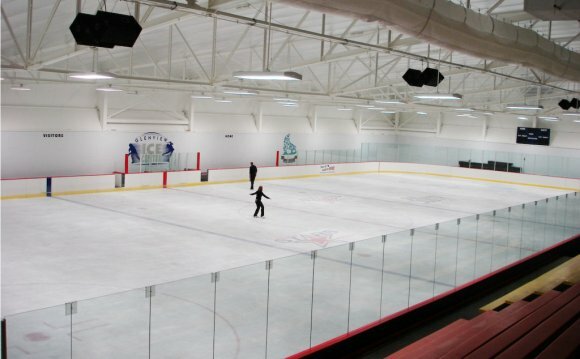 Summer camps for figure skating and hockey have the year's largest intake of unskilled skaters. Many kids fall and bang their skate blades into the ice, chipping a large chunk out. Beginning figure skaters learning spins dig the toe picks on their skates into the ice, making deep potholes for you to trip over. 2. BOARD CREEPERS can be any ethnicity, age or gender; they are simply people who have never been on the ice before. The most challenged Board Creepers have never been on roller skates, in-line skates or even a skateboard and have no other experience to parlay at the rink. They are a barrier to you because they fall and sprawl. It's not their fault they are this way. They have not gotten the basic mechanics of how to push side to side to go forward or how to swizzle. It is nice if you take a little time to show Board Creepers a few skating basics. And try to discourage Stage Two Board Creepers, which are Creeper Clusters. Creeper Clusters occur when two to five tweens or young teens feel there is safety in numbers in their collective inability to skate and band together, moving around the ice in a large, slow moving and wobbly wall. 3. MOVING PYLONS are those adorable little tykes that are learning basic skating very properly and they are slow. Dear God, they are slow! At least they are equipped for safety, usually wearing a helmet, face mask and gloves to protect against their inevitable and frequent spills. Anything you are working on improving, like skating faster or doing crossovers, must take a back seat to giving Moving Pylons on the rink a safe berth. 4. FAIRY DUST DREAMERS skate very well and are spreading their wings to the more complex maneuvers and stunts in figure skating. To be honest, figure skating is a more difficult set of skills to master. Unfortunately for you, Fairy Dust Dreamers are the skaters who have just gotten good enough to be dangerous. Figure skaters that are concentrating will stay out of your way, but Fairy Dust Dreamers' lack of attention and the number of times they twirl into your path make them one of the hardest barriers to dodge. 5. SPEED BUMPS are small children that are sitting on, lying down on or playing with the ice. Unlike roadway speed bumps, you cannot run over them - no matter what. Double or triple the space you would give to a Moving Pylon. Speed Bumps usually cause the next barrier to appear. 6. PARENTAL POOPER SCOOPERS are slow but temporary. Chances are a Speed Bump is pooped, and after trying to ignore the matter for a while a resigned adult will come in as a Parental Pooper Scooper. This barrier will be off the ice as soon as it is understood that it is time to go home. No, really, we're going home. Now. Dinner will be ready soon. There is no choice, we're going home. We can come back next week. Come on! 7. SKATE PIMPS are best recognized by having their own sound system and a smug attitude - and you dearly wish you could skate even half as good as they do. Skate Pimps started off as Moving Pylons, having been put on the ice by their parents shortly after they made the jump to solid foods. Unfortunately, they are extremely bored adults and everyone else is now their Moving Pylon - including you. They will weave in and out of all other skaters at top speed, backwards. They will storm up to others only to pivot at a 90° angle and dart off or stop on a dime, sharing sprays of ice. The Skate Pimp is a terrible distraction, so just ignore him and trust that he or she is fully capable of dodging you. Sometimes, if they feel generous, a Skate Pimp will give you a valuable tip or advice. 8. THE ZAMBONI running late. Sometimes you show up early, pay the fee, lace up your skates and are ready to go... and the Zamboni is still making its laps around the ice. Better rinks try to keep things on schedule but sometimes they fall behind. The Zamboni is a barrier needed to avoid the first barrier listed: Moon Craters. Just be patient and watch the Zamboni circle around. These are the primary perils of public skate times, but this list is by no means comprehensive. Depending on how often you skate, you may encounter further problems and some may even be specific to certain ice rinks. Go forth and practice as much as you can, armed with the knowledge that there will be challenges to learning how to skate better - and some of those challenges paid to be on the ice for the same reasons as you. Figure 8 ice skating at tech school!